Street Vegan really reminded me of Vegan Secret Supper, in that it looked just a bit too fancy to be an everyday cookbook. But, like Vegan Secret Supper, it pleasantly surprised me. Some of the recipes and ingredients lists are much simpler than I would have guessed, and a lot of them include additional components that are easily left out. All in all, it provided me with a wonderful month of food. The breafkast and soup sections were particularly good. 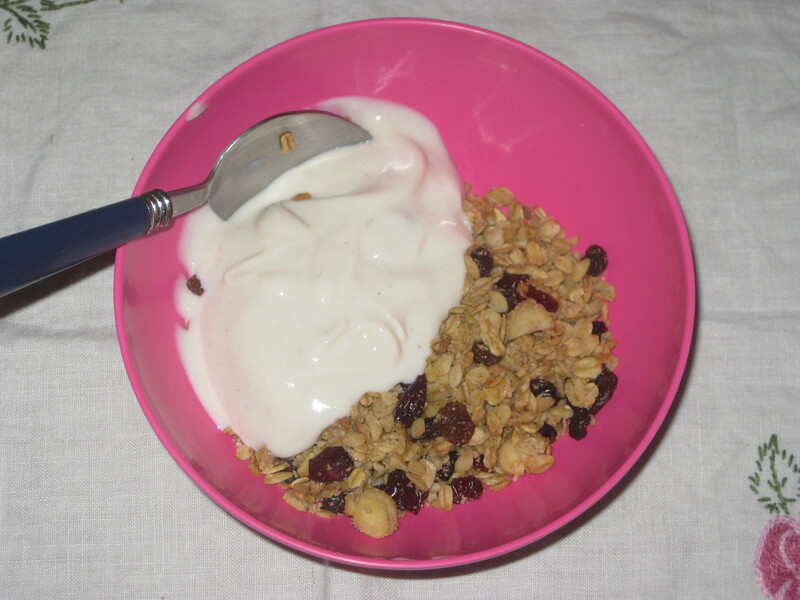 Starting with breakfast, the cranberry Brazil nut granola was beautiful. It tasted like Christmas, thanks to the orange, cinnamon and cranberries. I’ll definitely make it again during the festive season. It was a great start to the day. 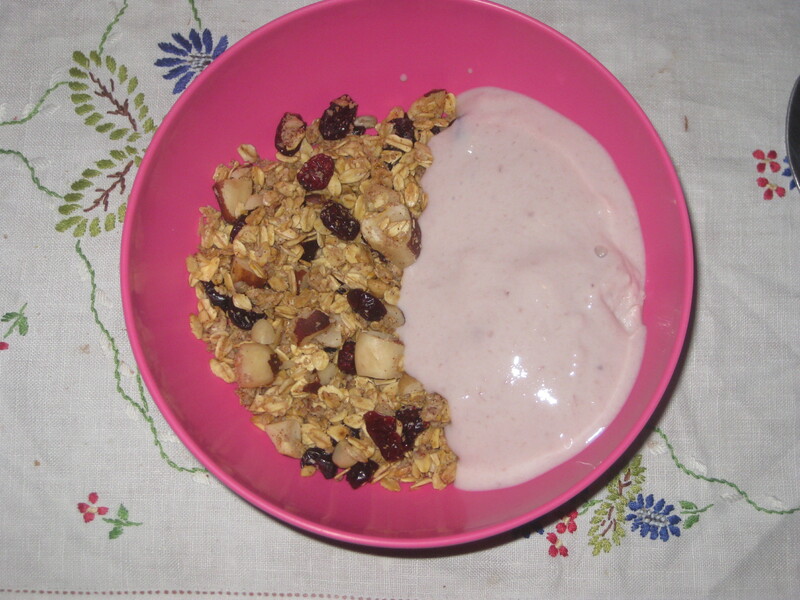 The other granola recipe is equally decadent: White Chocolate Macadamia Granola. I wouldn’t even know where to start looking for chocolate essence, so I left that out and didn’t really feel its absence. Similarly, dried cherries are not something I’ve spotted yet here, so I used cranberries again instead. It was sweet and luxurious, and I really enjoyed it. As it uses macadamia nuts and cocoa butter, it’s too pricey to join the regular rotation, but it’ll be good for a treat. The almond milk French toast was a fantastic breakfast-time treat. 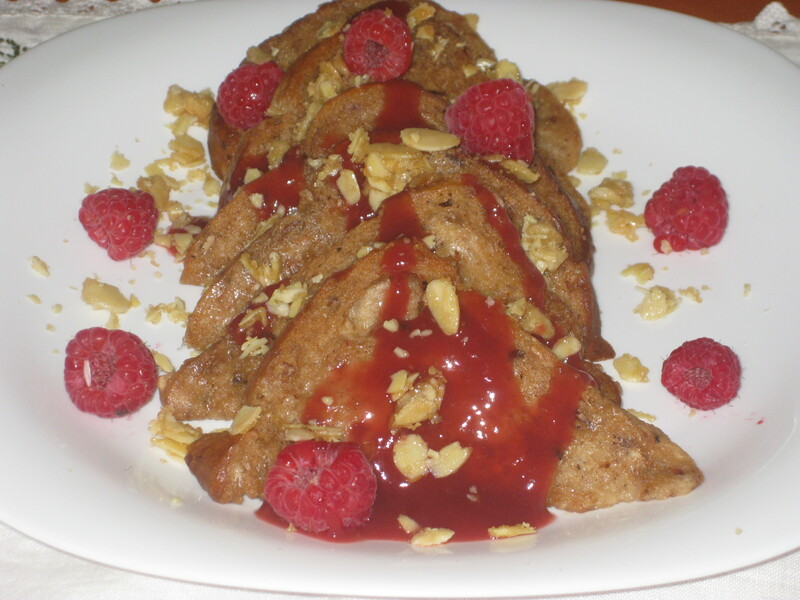 This was one of the occasions where I made all three components: the toast itself, the raspberry coulis and the sugary almonds. Serving coulis for breakfast feels pretty fancy, I’m not going to lie. I used orange instead of grapefruit for that, and made it the day before, along with the nuts. That meant all I had to do in the morning was whip up the batter and fry the bread, so it was a deceptively simple effort in the kitchen, and Dr HH was suitably impressed. It was really good. I was worried the coulis wouldn’t work, but everything tasted fantastic together. 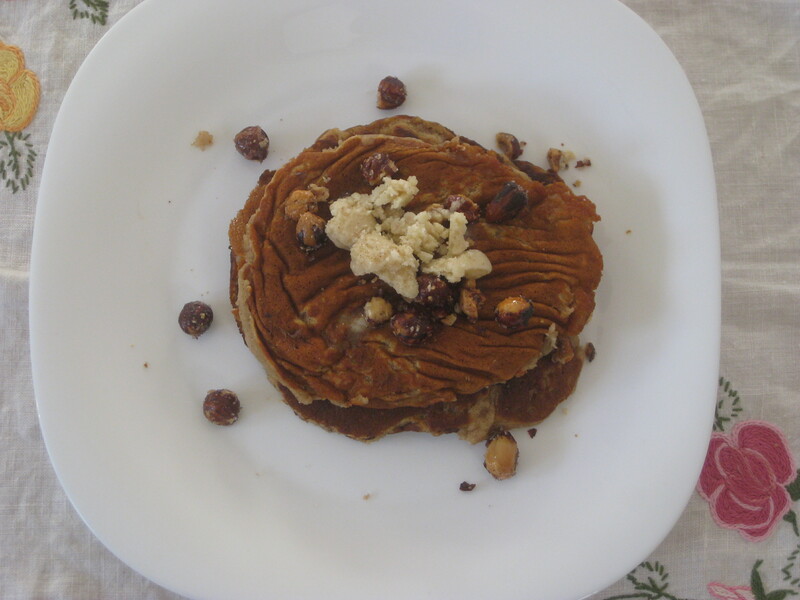 I made the bourbon hazelnut pancakes without the bourbon (easy to do, as it’s not in the batter, only with the nuts). Once again, this featured sugary sweet nuts, hazelnuts this time. They were scattered on top of the batter as the pancake cooked, and added a nice sweetness and texture to the pancake. I also made the cardamom butter, only I used cinnamon instead of cardamom. I wasn’t bold enough to try it on my pancakes, as I thought the savoury flavours were a little too strong (rice vinegar and olive oil). Dr HH thought the coconut and cinnamon shone through, so he went for it and really enjoyed it. With the butter or with golden syrup, these were delicious. 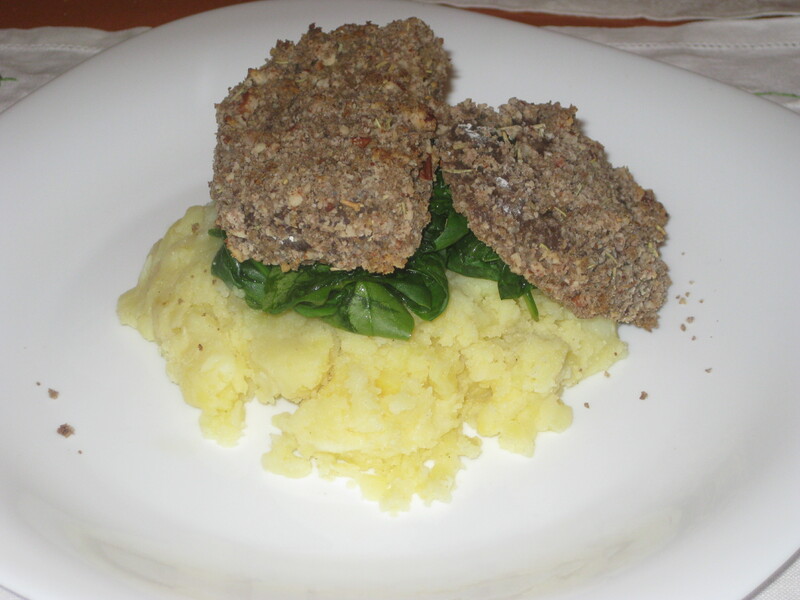 And I even made a savoury breakfast too: these maple mustard breakfast seitan strips. There’s no reason to limit these to the breakfast table, though. 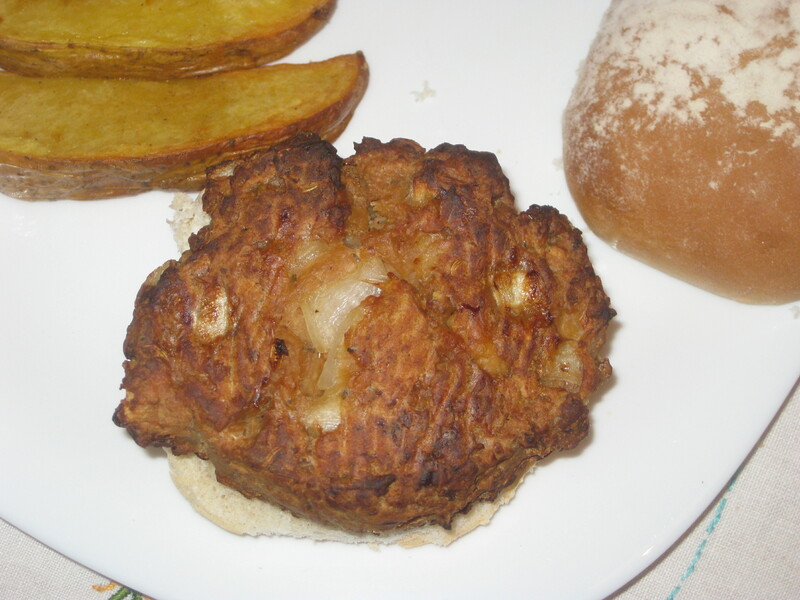 I cheated and bought ready-made seitan, and baked it rather than frying. They were delicious! Usually I don’t like to mix sweet and savoury flavours, but it worked really well here, the balance was just right. 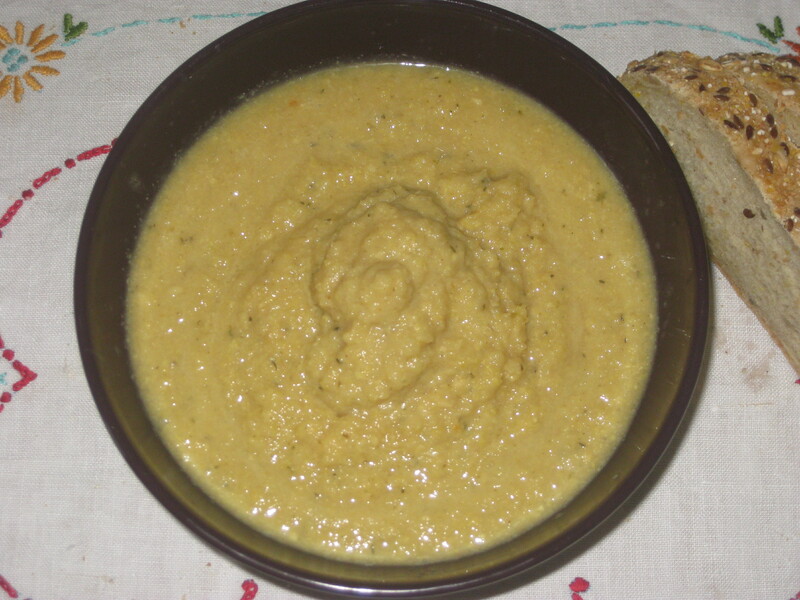 The creamy roasted almond cauliflower soup was quite easy to make, and I liked the idea of roasting the veg and nuts first. The final result had plenty of flavour, and a good thick texture. I thought the maple butternut squash soup was a wee bit too sweet. A bit more spice would have balanced it out nicely. Dr HH disagreed and thought it was already well-balanced, which is an unusual reversal of our roles in the sweet tooth stakes. 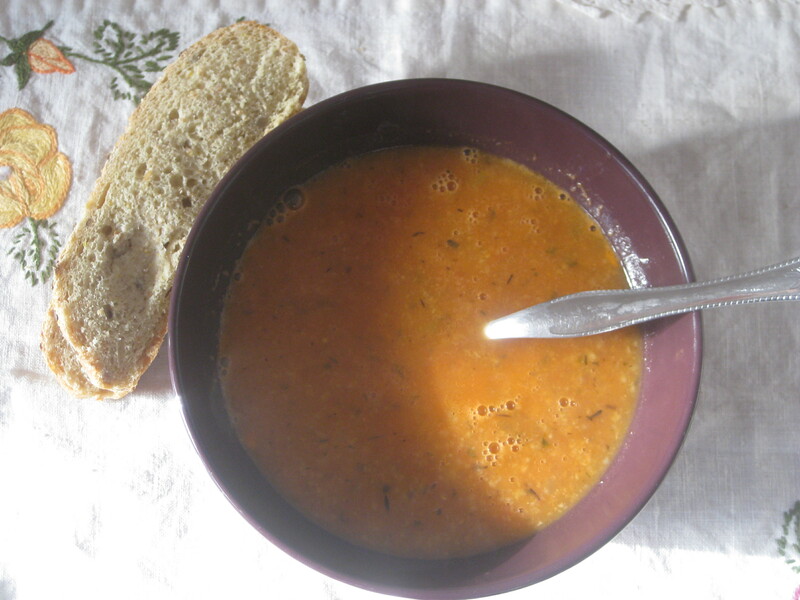 It’s a lovely autumnal soup: the same colour as the leaves falling from the trees. 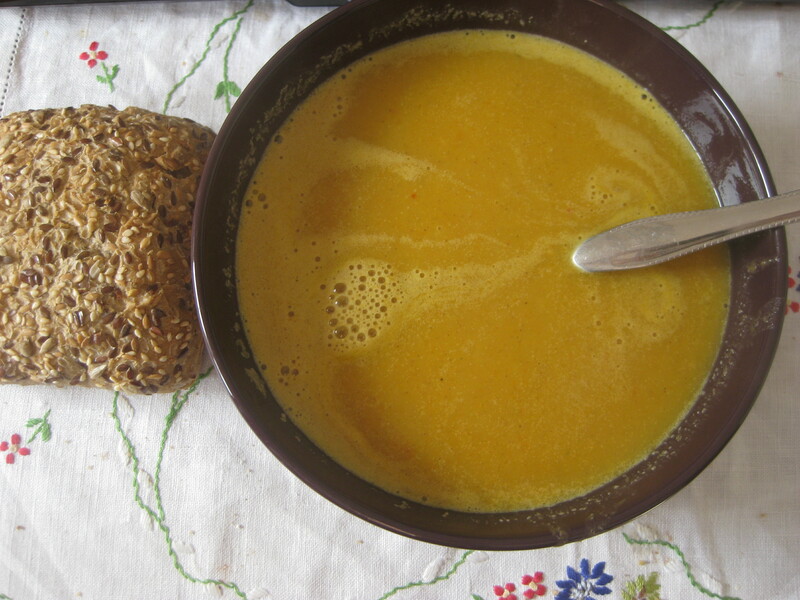 Dr HH has a strict no-noodle-soups-for-packed-lunch rule, which I always adhere to (for some reason he thinks slurping noodles and splashing soup over his beard would make his colleagues look down on him), so I made the ginger laphing soup one weekend. It had some very exciting flavours: ginger, soy sauce, chilli, salty peanuts. It was just crying out for a squeeze of lime juice to complete it. 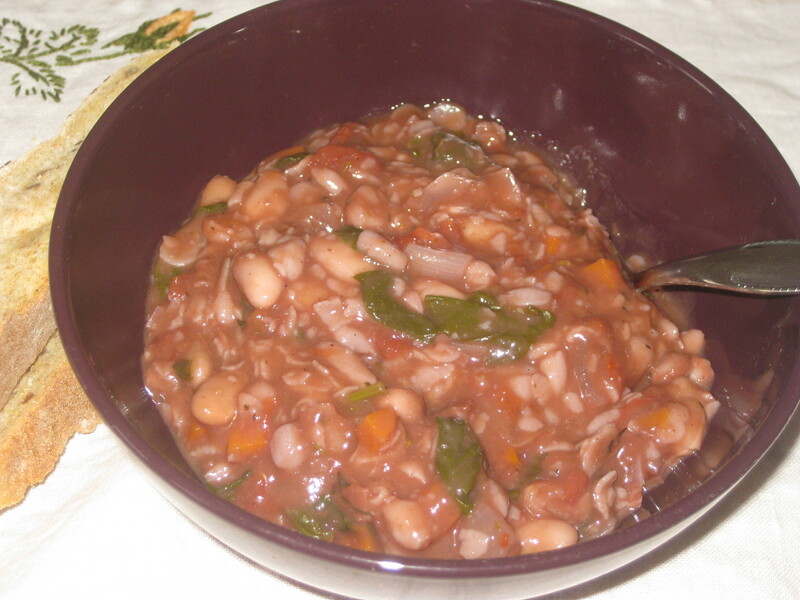 This was great for winter, when you want something spicy and warm if you’re a bit bunged up. The French lentil soup was another good one. 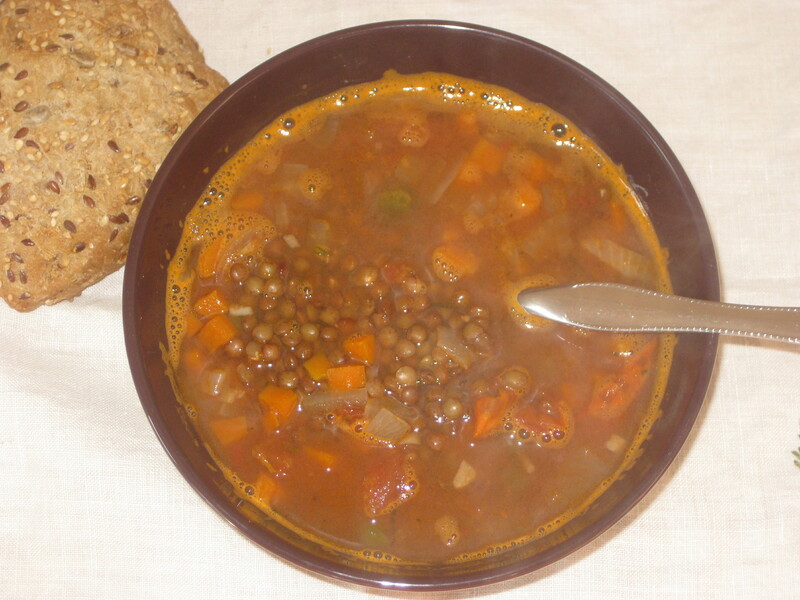 I love a soup with a tomato base, and this one had some good textures as well from the carrots and lentils. 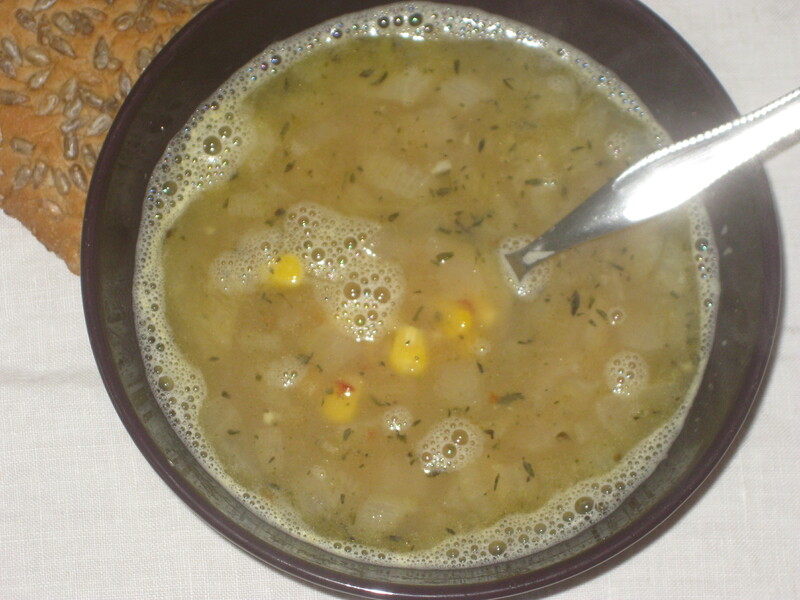 You can’t go wrong with this kind of soup. 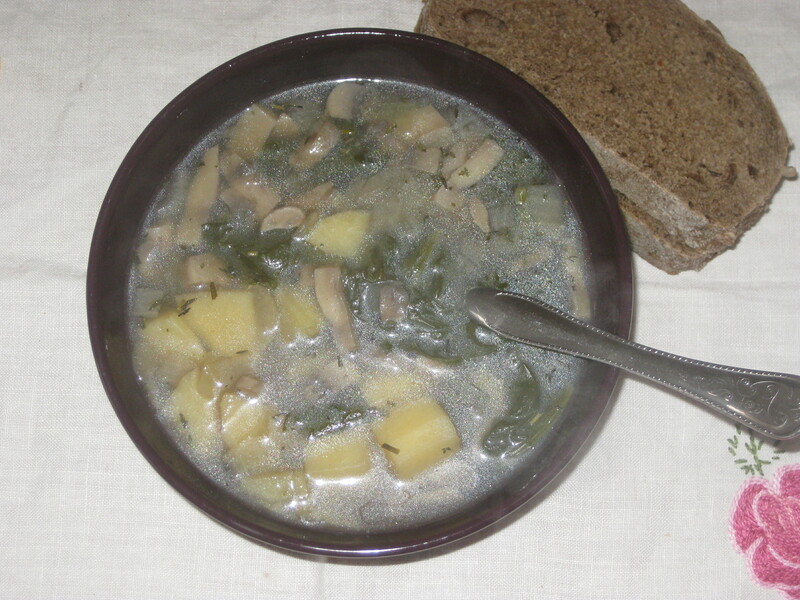 The wild mushroom, spinach and potato soup was not quite as exciting. It was fine, but not as exciting as the others from this book, probably partly because I couldn’t get hold of any exciting mushrooms. I wasn’t 100% convinced by the Thai coconut curry soup when I made it. 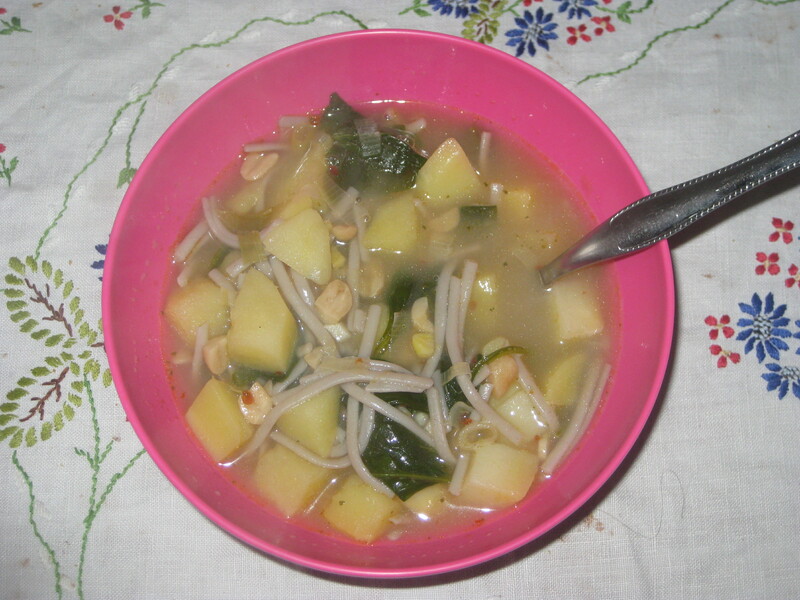 It has some autumnal/wintry veg in a rather exotic broth, and I was worried it would be a bit confusing. But it was delicious! Spicy food is great in colder weather anyway, and it all combined beautifully. I loved the chickpeas in there too. I made this with green curry paste, because that was the only vegan Thai curry paste I could find. 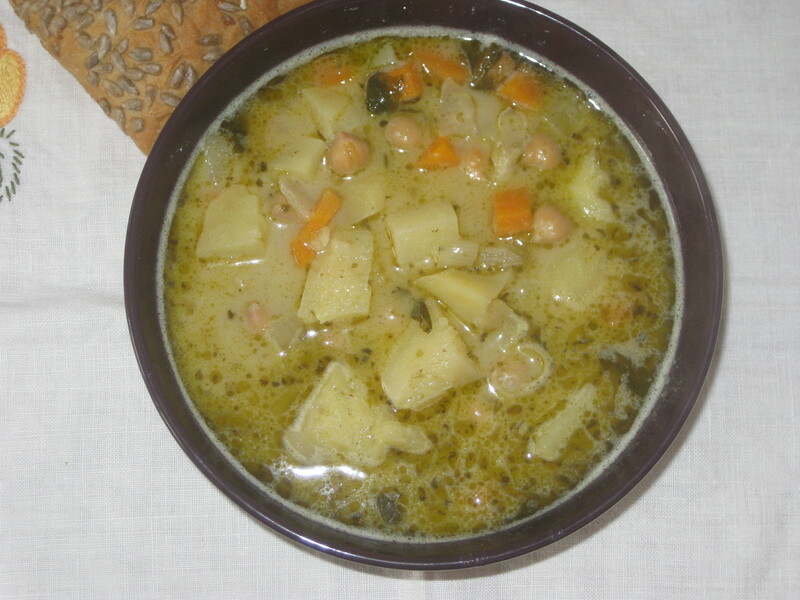 I made this soup twice in November as it was such a hit. The Jalapeno corn chowdah was possibly a bit less exciting, but it was good. I wasn’t convinced by the consistency, and it isn’t the best chowder recipe I’ve got up my sleeve, but it was tasty and enjoyable. I made a few changes to the tomato sage bisque, using tinned tomatoes, bulghur wheat and dried sage. I thought it had quite a lot of different flavours competing and was a bit confusing, but Dr HH was a fan. It had a really good, creamy texture anyway. I was quite anxious when making the red wine minestrone because it had two cups of wine in it. That’s a lot of alcohol! I felt like I was getting drunk on the fumes while it was cooking. But happily, it was not boozy by the time it was cooked. I really loved the flavour from the wine and thought this was a good hearty stew rather than a soup. It could definitely be an evening meal. I loved everything: the beans, the teeny tiny pasta shells, the veg. This was one of the highlights of the book for me. 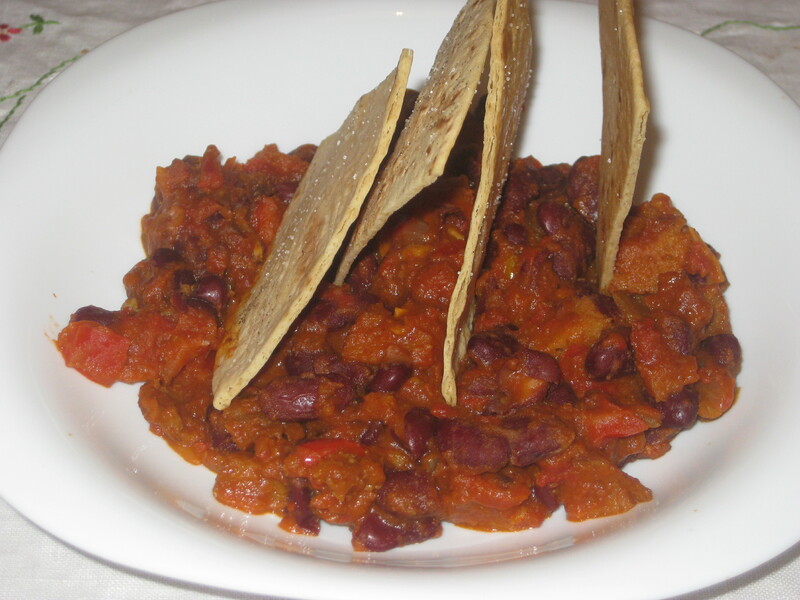 The seitan asado and ancho red bean chilli was in the soup section, but I served it for dinner. Most of the flavour is packed in the seitan, and it’s a good balance of sweet and spicy. I don’t have any other chilli recipes with a meat substitute, so this was a different take on chilli for me and one I would happily revisit. 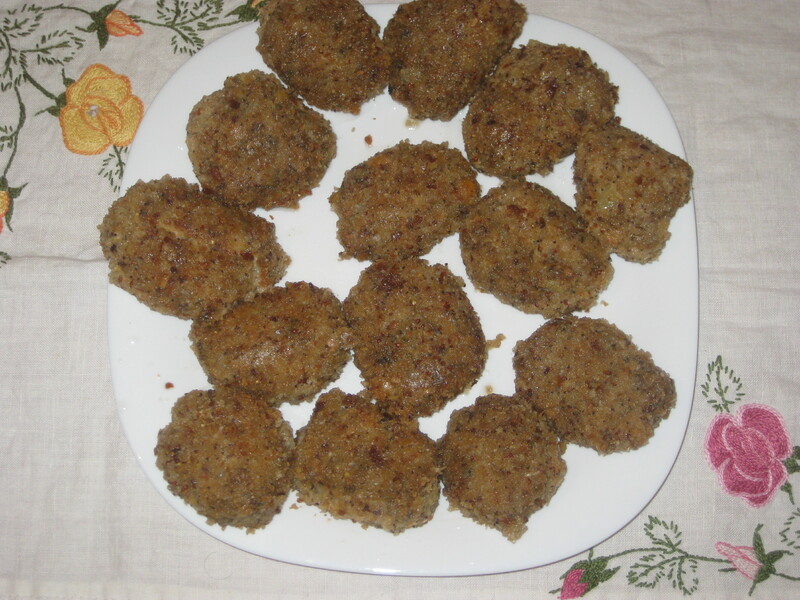 From the appetiser section, I made these New England-style chickpea “crab” cakes, which were rather fiddly and time consuming, but worth the effort. Top tip when making the crab cakes: add the flour after blitzing the rest of the ingredients, otherwise it may be impossible to work with. I had to add water, then add more flour, and chill it to get it to hold…it was quite the palaver. But the flavour was really good! Rather than splashing out on other sea vegetables, I just used a sheet of nori for the salty sea flavour, and it worked a treat. Likewise, normal breadcrumbs rather than panko are fine. 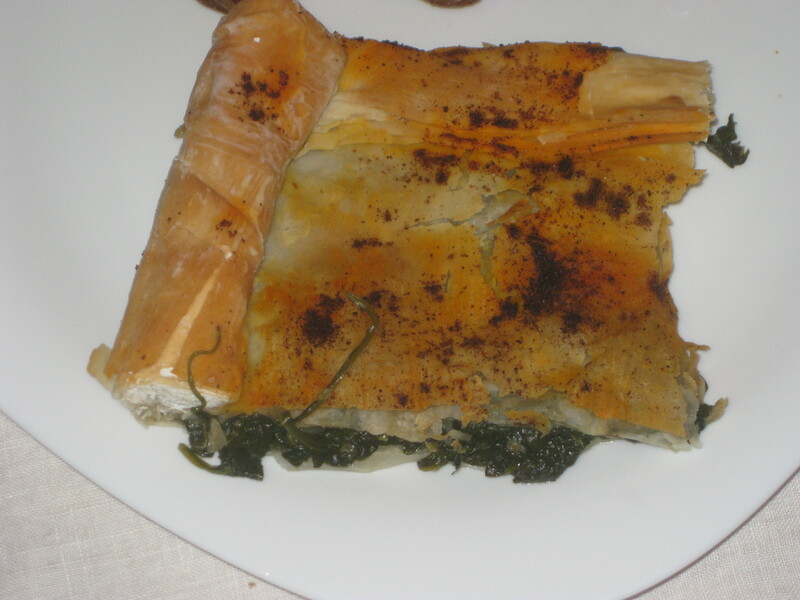 And from the same section, this flaky spinach pie. I was very happy to discover vegan filo pastry in Marks and Spencer is Prague, considering all of their other pastry and biscuits seem to have the words “All butter” in the title. According to the book, this pie is served practically every day at the Cinnamon Snail food truck. I was expecting something a bit more special. It was nice, but the filling was so predominantly spinach that it was actually a bit boring. 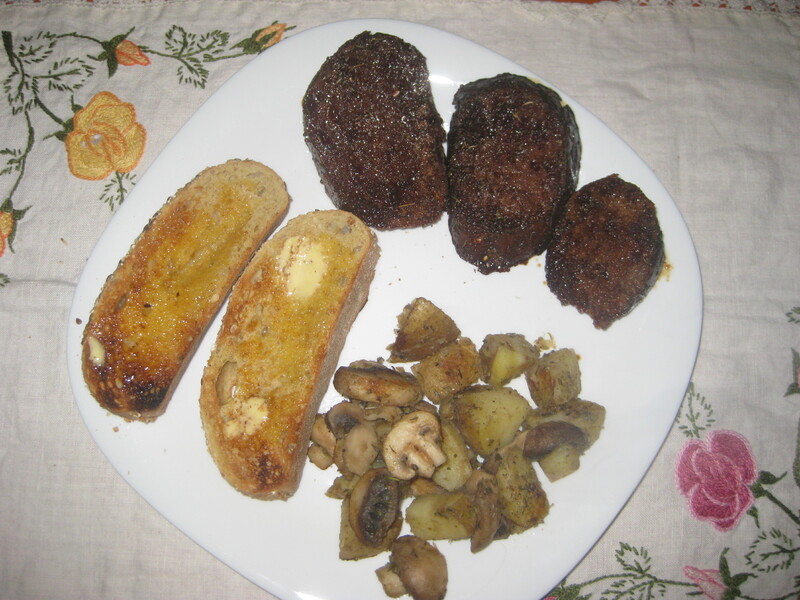 It needed something else: some mushrooms, or potato, just something to bulk it out and give it a bit more variety. It tasted much better the next day, but still needed a little something more. 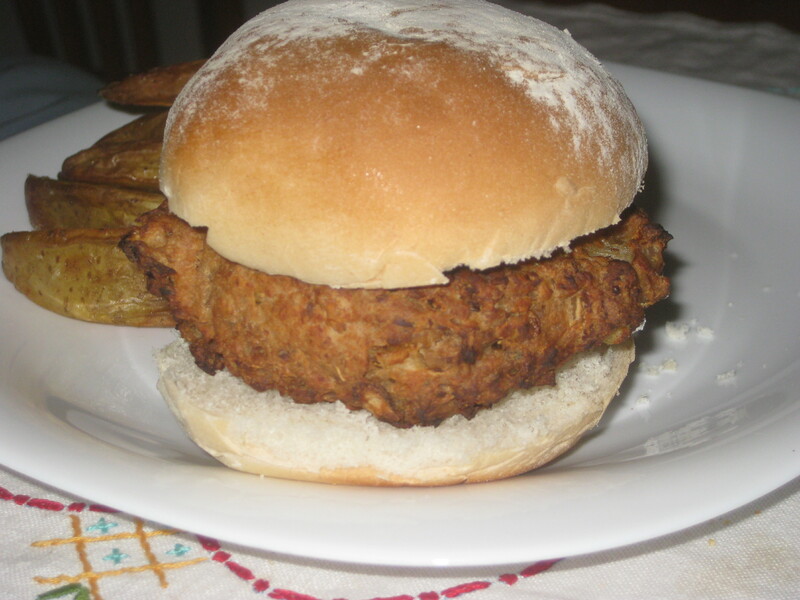 The sage tempeh sausage sliders were magnificent. I made them into four great big burgers, and, much to my astonishment, they did not just crumble or remain soft like most of my burgers. No, these were crispy on the outside, smooth and soft on the inside. And they were tasty! Great combinations of tempeh, sage, fennel seeds and onion. I was absolutely giddy at their success. Dr HH and I usually go out for tea on a Friday night, but one week I decided to surprise him by cooking something a little fancier than usual on a workday. 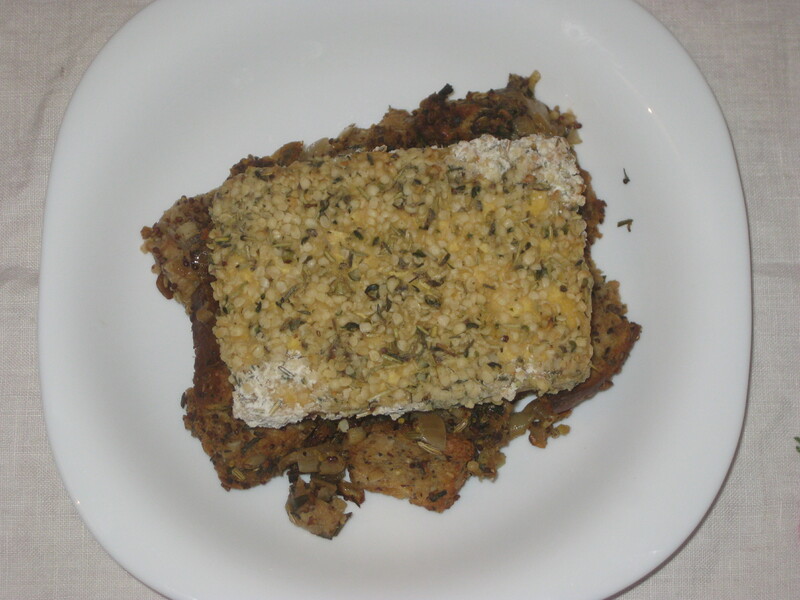 The rosemary hemp seed-crusted tofu with tarragon garlic bread pudding was fairly time-intensive as we only have one shelf in our oven (it’s ridiculous, but a lot of flats we looked at had no oven at all, so we’re still winning technically) and both elements needed to be cooked. But the recipe was surprisingly easy to follow. 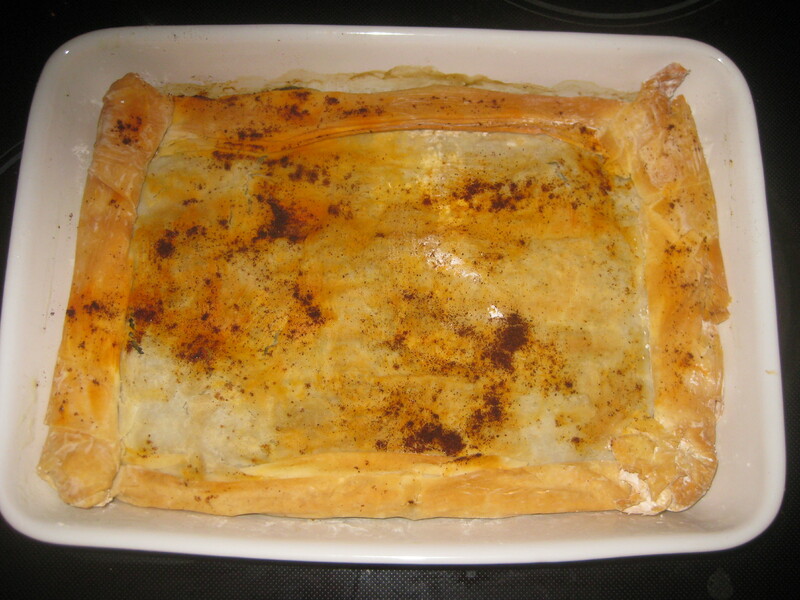 The tofu tasted great, I loved the herbs in the crust. The bread pudding also had some excellent flavours. I think this would be a nice festive meal and am considering making it again for Christmas dinner. The pecan crusted seitan was similarly impressive and festive. The seitan retained its nice, tender texture and the crust was nutty and delicious. It was nice for a classic “meat and veg” style plate of food. 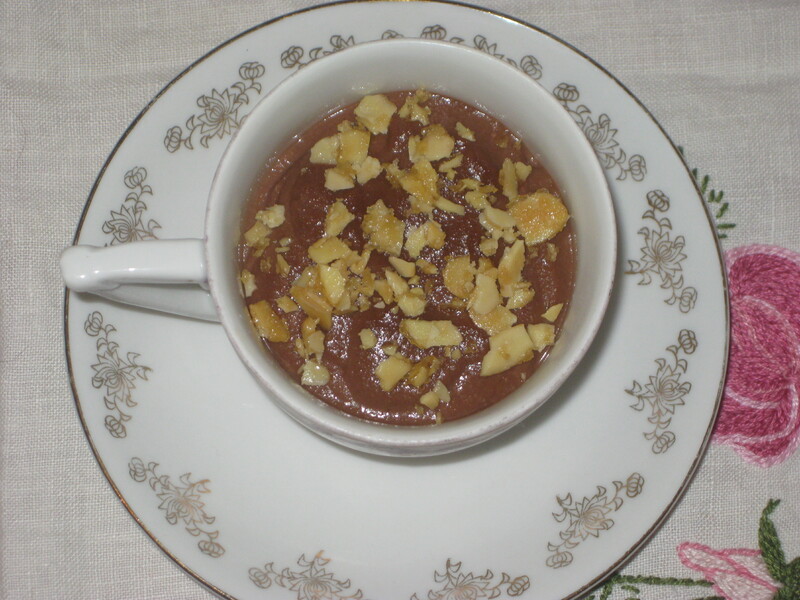 From the dessert section, the raw chocolate pudding was a simple and effective way to impress. 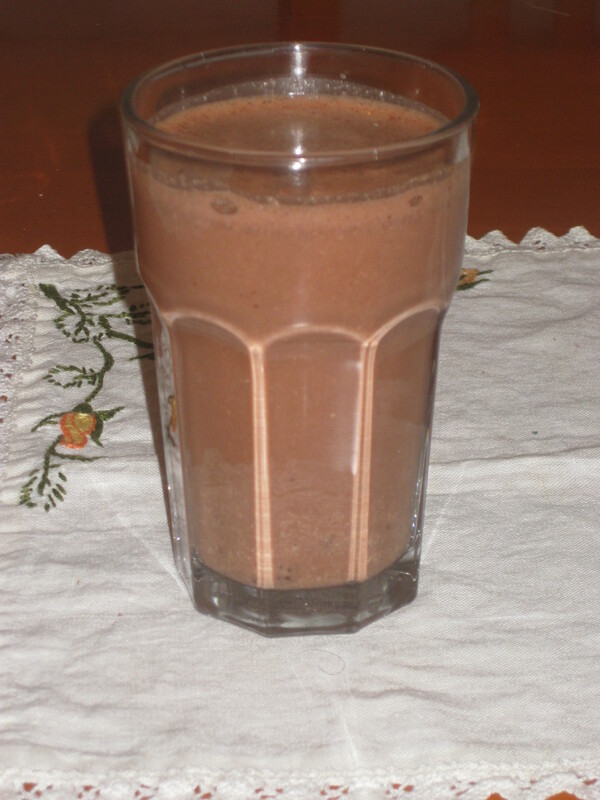 The only ingredients were cocoa powder, maple syrup, water and cashews, so it was very easy to throw together and had a good texture and taste (though there was a touch too much maple syrup for my liking). The recipe suggests topping it with cocoa nibs, but I had some sugary almonds leftover from the almond milk French toast, so I crushed them onto the top instead. They were a great addition! I definitely got a lot of use out of this book. The soup section, as you can see, was pretty extensive, making it perfect for me: we have soup for packed lunches every day. I made most of the soups in there and was only disappointed by one, so for any fellow soup-lovers, this book is a great purchase. It also had plenty going on in the breakfast section, including a good balance of sweet and savoury options. However, I thought the mains were a bit lacking. There wasn’t really anything that looked easy to throw together after work, nor any big pots of stew that could be made in advance and stored in the fridge. The appetiser section looked amazing, and there’s also a whole chapter on doughnuts. Alas, I’m a bit wary of deep-frying anything on an electric hob that takes a lifetime to respond to temperature changes on the dials, so I’m waiting till I’m home over Christmas to try a few of them. This is definitely a book I will go back to again and again. I’m taking a break from cookbook of the month in December, as I’m going to be on the move and it’s more of a time for old classics rather than trialling new recipes. Hopefully Father Christmas will be good enough to provide a book for January! This entry was posted in Cookbooks and tagged Cinnamon Snail cookbook, Street Vegan, vegan cookbooks. Bookmark the permalink. Those soups look pretty awesome! I feel like such a dope, it seems everyone online loves the Cinnamon Snail and my friend and I just found out that we missed the truck this year, it was really close to us every weekend at a farmers market. Big face palm. I hope he keeps his truck there next year, but I don’t know since I guess he is opening a restaurant in NYC. Argh, that’s frustrating! I’m desperate for a trip to New York, mostly just for the food. I’ve been wanting Street Vegan for a while now, and every time I see a new review, it totally convinces me I need to have it on my shelf! I’d been eyeing it up pre-release as well, it was definitely worth the wait. Put it on your Christmas list!